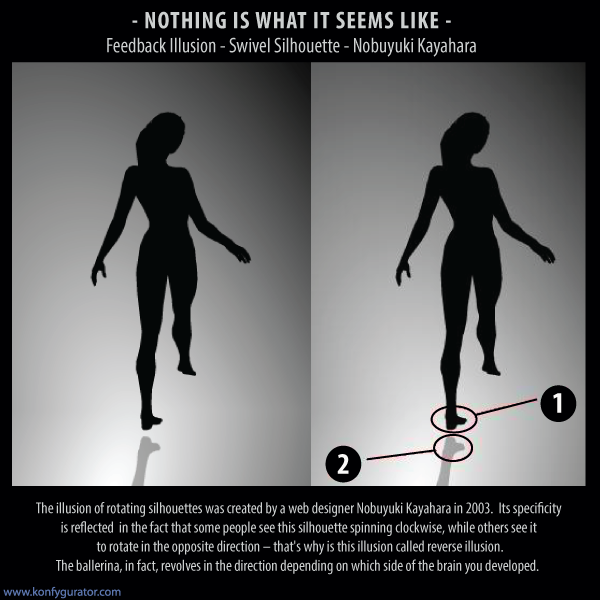 The illusion of rotating silhouettes was created by a web designer Nobuyuki Kayahara in 2003. Its specificity is reflected in the fact that some people see this silhouette spinning clockwise, while others see it to rotate in the opposite direction – that's why is this illusion called reverse illusion. What do you see, which direction is silhouette rotating?. It could be said that it is one of the interesting optical illusions. The ballerina, in fact, revolves in the direction depending on which side of the brain you developed. Also, with a little bit of concentration and turning thoughts you can change direction of ballerinas. Close your eyes for a few seconds and visualize that it spins in the opposite direction, and then open your eyes and look again. The secret lies in the raised leg. Easy identification of direction changes lies in the fact that the rotating silhouette is not looked at directly, but only with our peripheral vision. What makes this result, these ambiguous optical illusions, in fact, is that complete silhouette is black and that offers no sense of depth to the figure; and that's why the direction of the rotating silhouettes is ambiguous.